New Cloud IaaS providers are coming out of the woodwork these days. Here are ClearlyTech’s current picks for the top-tier solutions you should consider before you deploy to the Cloud. Amazon AWS is the 400lb. gorilla in the space. Their pure-play IaaS product is their Elastic Compute Cloud (EC2). It’s the largest, oldest, and most feature-rich of its peers. Amazon has had its issues over the years, sometimes bugs, sometimes bizarro pricing, and their share of highly publicized downtime. But they are a giant, and with all that experience comes a maturity that should count a lot when hunting for a reliable partner to run your high-traffic application. They are a tried-and-true solution at this point, warts and all. Note that Amazon may not be (probably isn’t, in fact), the best technical solution. Other newer entrants to the game have had the opportunity to watch Amazon’s trials over the past 7 years, and improve in the few areas that Amazon has shown weakness. I count two auxilliary areas I’ve seen AWS fall short. Amazon has terrible customer support for AWS. Even if you pay for the Gold support, I’ve found it’s impossible to get a truly knowledgable person on the phone, especially during a crisis situation. Amazon appears to be taking the Google approach to support. Make sure everything runs right, so you never have to interact with your customers. And when things don’t work, throw them just enough of a bone so they don’t leave, while you fix the problem. Amazon is starting to feel like an aging platform. Network and Disk I/O in particular have inconsistent performance. While they are upgrading all the time and rolling out new tiers of machine (like Provisioned IOPS, which is consistent, but still not particularly fast), and recently SSD drives, AWS is at risk of getting passed by some players investing heavily in newer infrastructure with a fresher architectural approach. Despite these minor issues, ClearlyTech favors Amazon AWS for large scale production needs. 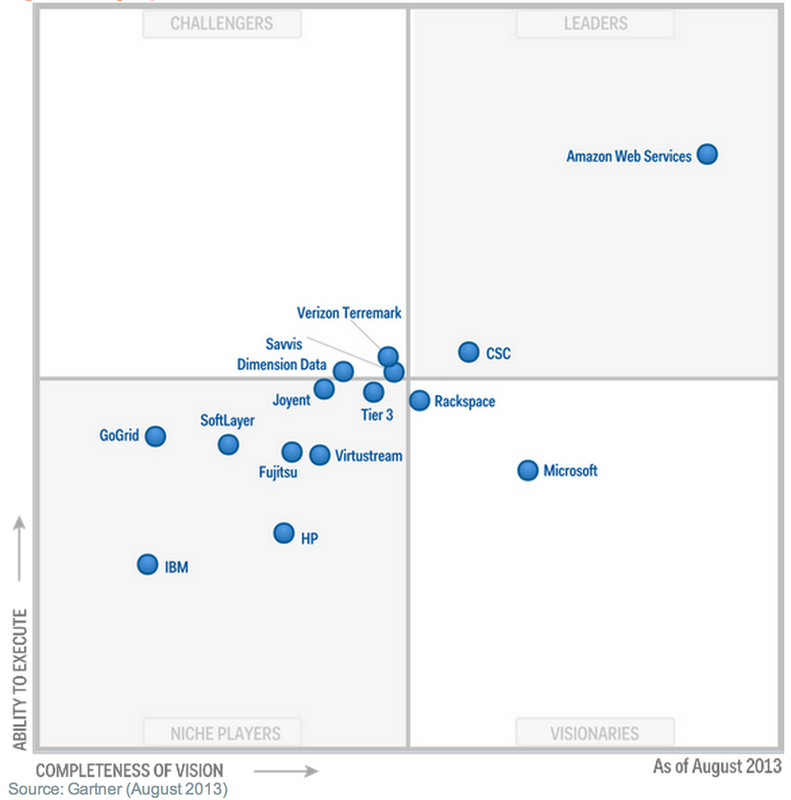 Gartner Group agrees so strongly that AWS lives in a quadrant all its own among cloud hosting providers in their 2013 report. ClearlyTech recommends Rackspace as another long-standing player in the hosting business worth a look. Rackspace was a pioneer in the managed-hosting space (they run your traditional infrastructure), and has recently put a lot of attention into a Virtualized Cloud hosting model to compete with AWS. If the lack of good customer support from Amazon is a deal-breaker for you, Rackspace is a very appealing alternative. Every time I’ve called Rackspace, a real person answers the phone, is sufficiently technical, and handles my needs quickly and painlessly. Their commit to customer support shows. For pure ease-of-use, low-prices, ClearlyTech supports Digital Ocean, the self-described “Simple Cloud Hosting”. They are built on a new clear technology stack, including all SSD drives, mitigating some of the risk of bad disk I/O slowing down an otherwise sufficient server. This is a great option if your developers need extra horsepower without a lot of hassle, or if you need to get a prototype up for customer testing on a public IP address with easy setup/teardown process. They are a pleasure to use, and time will tell whether they keep expanding their offering into something mature enough to use for more serious production deployments. Thousands of reputable companies rely on them for no-frills managed data-center hosting. You may still need some sysadmins to run the show, but SoftLayer consistently has good prices on excellent hardware and extremely reliable hosting. Google Compute and associated services is going to make a run at AWS in the next few years. They’ve learned a lot from watching Amazon, from their own experience with huge scale provisioning of cloud resources, and from App Engine, their initial platform as a service cloud play, which failed to gain traction among serious startups and open-source developers. Microsoft Azure has a tough row to hoe, as fewer and fewer companies are deploying Microsoft technologies to the cloud vs the rapidly evolving open-source stacks. But Microsoft isn’t taking it lying down. We’ll be watching what innovations they can bring to the table, especially given that they control the hardware and the software stack. And if you need to deploy Windows to the cloud, we prefer them over Amazon EC2. Paraphrasing one of the most common questions asked by non-technical founders when launching into the phase of building a web application, web service, or mobile API — What framework should we be developing in? You know that all frameworks are really just a set of helpful libraries built to be leveraged by a particular programming language. In many ways, the choice of language will have a longer lasting impact on your organization than the choice of framework itself. Whether your app will scale has everything to do with your architecture. You should care immensely about how the code is structured, the relationship between web servers, database servers, caching layers, services, and asynchronous queues. A properly architected application will scale in almost any language or framework. When you read about huge-scale applications, you’ll rarely find them talking about what language or framework they used, but rather what architecture works at scale. How efficiently your application scales, on the other hand, may well depend on the language and framework used. For a given application load, you might find that code built in Ruby on Rails might require 10 servers, while the same application running in erlang on Chicago Boss might only require 2 servers. Or vice versa, to be clear. Some kinds of applications suited particularly well to Rails might turn that table. While you might be tempted to demand the most resource efficient framework out of the gate, don’t! You’d be making the mistake of premature optimization. You don’t even know if you have product-market fit yet, let alone what the performance profile of your application will be. Factor #2 here reminds us that designing a flexible architecture up front is more important than picking the best language/framework. Make sure your developers are making conscious architecture choices from day one, so you don’t paint yourself into a frustrating corner. Two factors mitigate the risk associated with choosing a “less scalable” web framework. The ability for your early developers to implement new features and changes rapidly, and with confidence, is absolutely crucial for you to have any chance at your business succeeding. By the time you have millions of users, your application will most likely be large enough and complex enough that your engineering team will start to rebuild various component pieces using more specialized languages and tools anyway. If you properly architect your application from the start, you won’t be “stuck” forever with any particular language/framework choice. Facebook is an interesting example. They started in PHP, which was the defacto standard for dynamic web sites back in 2004. Now today, as one of the largest web properties in the world, scale is incredibly important to them. A 10% difference in efficiency makes a multi-million dollar difference in hosting costs and user-retention (faster site = more users sticking around). Rather than change languages or frameworks (an arguably impossible task at their scale), Facebook wrote a custom compiling that translates PHP code into C++ code, so it can run without the interpreter layer on their datacenter hardware. So once you get to Facebook’s scale, then you can worry about all sorts of things. For now, use the framework that gets your site actually built the fastest, over the one that runs it the fastest. If you don’t hire a rockstar founding engineer primarily because he wants to build your site in CakePHP when you were leaning towards Scala Lift, then you’re a fool. Developers will work best in the tools they are passionate about, and nowhere is that more true than the framework of choice for major web applications. So listen seriously to the reasons your developers want to use a particular framework. Quiz them. Make sure they understand the pros and cons of their choice. And then, in the absence of other compelling reasons, encourage them to go build with it. Different web frameworks, and for that matter programming languages, have different philosophical approaches. Ideally, the kind of software you are building and your process for building it will be aligned with the philosophy of the framework you choose. For example, if you are building a high-volume messaging or realtime gaming system, you might be better served with a language that’s designed to be really good at concurrency like Erlang, or perhaps Node.js. If you are building rich interactive content site, you might find great support and like-mindedness from the Ruby on Rails community. If you are building a banking application, the legacy and enterprise adoption of Java J2EE might be a safe bet that assures you support from heavyweight customers who care about your backend platform choices. Check out their website. For comparison, here are a few: Rails, Django, ASP.NET, Yii, Play, ExpressJS. Read their main marketing points. Look for other companies using a given framework. Often the frameworks include lists of companies using them right on their site. Do they represent businesses with products like yours? Businesses you respect? Ones whose applications are fast, modern, and running reliably in your estimation? Read the documentation for the major frameworks. Even if you don’t understand it all, does it seem comprehensive to you? Do they include lots of guides and clear english descriptions and code samples? Finally, evaluate the community around a given language however you can. Talk to developers in your network who have used it (can’t track any down? might be a bad sign). Read threads on some mailing lists or Google groups. Search GitHub for open-source projects, check out their activity and bug lists. Look for communities that are productive and friendly and supportive. Be wary of ones that are too exclusive, too new, or too elitist. The more mature and well-supported a framework is, the longer it will be around. And the higher-quality the community, the more support your developers will get, both in the way of documentation and friendly online help from others in the community, but also by way of great open-source libraries to help you get more done, more quickly. A quality community will attract more developers of all levels, which means a better experience for your developers. But also, it means more potential candidates for your business when you look to expand your development team. Candidates looking to build on a modern, fun, and thoughtfully-chosen web framework. Blah, blah, blah. Just tell me which one is the best? ClearlyTech will publish a series of articles on various framework choices, so stay tuned. In the meantime, keep an eye on ClearlyTech Recommends for up-to-date suggestions. All modern web applications — whether they are delivering a website, powering an API for a mobile application, or providing a B2B web service — are made with the same family of key ingredients. Developers love to apply physical metaphors to our abstract virtual world, so we describe this as the “application stack”. Do we need this kind of functionality? If we don’t have it now, when will we need it? Are our needs unique enough to require something other than a tried-and-true solution for this? For 80% of the items on the list below, your answers to the above questions should be yes, soon, and no. We’ll go into all these topics in more detail in future ClearlyTech articles, including where each piece fits, why it’s important, and lots of recommendations on specific technologies and tools for all these components. HTTP Server — your face to the world, the waiter who shepherds URL requests to all the other parts of your stack. A straightforward, but important piece. Web Framework — the server code that powers your site. Picking a language and framework represents one of the largest decisions you’ll make, affecting both the product and the kind of developers you’ll hire and groom. Java? Ruby on Rails? Python? PHP? Drupal? Node.js? Transactional Data Store — one or more databases which will support all the data being read and written by your web framework code. Picking the right data stores for your use case is critical for scale and performance. MySQL? MongoDB? Oracle? Redis? Relational? NoSQL? File Data Store — somewhere to serve downloads, videos, images, and static content. RAID array? Amazon S3? Akamai? Dropbox? Background Queueing — all the stuff that happens when your users aren’t watching. Sending email notifications, calculating leaderboards, pre-processing image uploads. RabbitMQ? Resque? ActiveMQ? ZeroMQ? Amazon SQS? Kestrel? Kafka? Caching Layer — when all complexity starts to act like quicksand and you need to speed things up. Search — searching through text is a very specialized problem, and typically deserves a specialized solution. Email / SMS / Push Notifications — outbound messaging to your customers, another specialty field you likely don’t want to build yourself. Qmail? Sendgrid? Mailchimp? Urban Airship? PubNub? Automated Deployment — rapid, reliable updates to your software, operating systems, and configuration, a must-have for any mature product. Monitoring — keep tabs on the health of both your systems and applications, get alerted when something goes wrong. Nagios? Munin? LogicMonitor? Pingdom? ServerDensity? PagerDuty? Reporting and Analytics — business intelligence that powers data driven decision making for your organization. Data warehouse? Dashboards? GoodData? Pentaho? Jasper? Crystal? Google Analytics? OLAP? RedShift? If you don’t know how your business is handling each of these, ask your tech team. If they don’t know, then raise this list with them, or reach out and ask for help. Or pray.